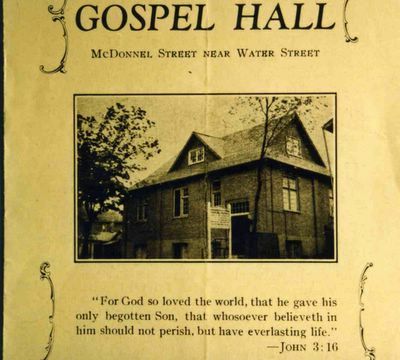 Our family attended McDonnel Street Gospel Hall when I was a child. I have many "precious memories" of my time in that small Brethren assembly. The property was expropriated many years ago and the local police station now sits there. How I wish I could go back and pay a visit to that special place. Fond memories of Children's Meetings with Uncle Herb (Meeks) and intimate "Breaking of Bread" services where "Old Mister Norton" started the hymns often flood my mind. Those were special times when God was shaping a young life to later serve Him. Small but sacred assembly hall where my life was shaped! Wonderful picture postings David! Some of us old Peterborough-ites really appreciate seeing that picture of the old "Hall". And yes, our remembrance of your Dad is exactly as he was in that picture - always smiling - always encouraging - a true Man of God. The old guy with the grandkids?? No one replied? Well, I will! He looks pretty happy and blessed!. Grandkids are great!! God bless you and your family.